South Dakota is a state located in the Midwestern region of the United States of America. It is named after the Lakota and Dakota (Sioux) American Indian tribes. South Dakota was admitted to the Union on November 2, 1889, as was North Dakota. 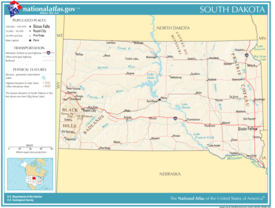 Located in the north-central United States, South Dakota is bisected by the Missouri River, dividing the state into two socially and economically distinct halves, known to residents as "East River" and "West River." 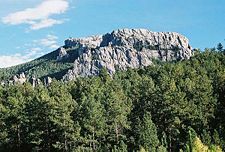 In the southwestern portion of the state rise the Black Hills, a group of low, pine-covered mountains. A region of great religious importance to local American Indians as well as a major draw for the state tourism industry, the Black Hills are also the location of Mt. Rushmore, probably the best-known location in the state and a widely-used unofficial symbol of South Dakota. Historically dominated by an agricultural economy and a rural lifestyle, South Dakota has recently sought to diversify its economy in an effort to attract and retain residents. The state is still largely rural, though, with one of the lowest population densities in the United States. It is considered to have an attractive business climate, offering one of the best economic environments for entrepreneurship in the nation. The state has no income tax, personal or corporate, and boasts the second lowest crime rate in the nation. South Dakota, historically and currently, is home to the Great Sioux Nation. 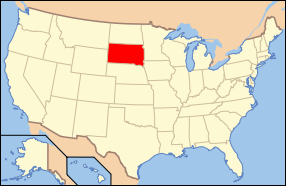 South Dakota is bordered on the north by North Dakota; on the south by Nebraska; on the east by Iowa and Minnesota; and on the west by Wyoming and Montana. It is one of the six states of the Frontier Strip. The Drift Prairie covers most of eastern South Dakota. This is the land of low hills and glacial lakes. This area was called Coteau des Prairies (Prairie Hills) by early French traders. In the north, the Coteau des Prairies is bordered on the east by the Minnesota River Valley and on the west by the James River Basin. The James River Basin is mostly flat land, following the flow of the James River through the state from north to south. The Great Plains cover most of the western two-thirds of the state. The Coteau de Missouri hills and valleys lie between the James River Basin of the Drift Prairie and the Missouri River. West of the Missouri River the landscape becomes more rugged and consists of rolling hills, plains, canyons, and steep flat-topped hills called buttes. These buttes sometimes rise 400 to 600 feet (120 to 180 m) above the plains. In the south, east of the Black Hills, lie the South Dakota Badlands. The Black Hills are in the southwestern part of South Dakota and extend into Wyoming. This range of low mountains covers 6,000 square miles (15,500 km²) with mountains that rise from 2,000 to 4,000 feet (600 to 1,200 m) above their bases. The highest point in South Dakota, Harney Peak (7,242 ft or 2,207 m above sea level), is in the Black Hills. This is the highest point between the Rocky Mountains and the French Alps. The Black Hills are rich in minerals such as gold, silver, copper, and lead. The Homestake Mine, one of the largest gold mines in the United States, is located in the Black Hills. The Missouri River, which runs through the central part of the state, is its largest and longest river. To the east of the river lie low hills and lakes formed by glaciers. Fertile farm country covers the area. To the west of the river the land consists of deep canyons and rolling plains. Other major South Dakota rivers include the Cheyenne, the James, the Big Sioux, and the White. The state also has many natural lakes, mostly occurring in its eastern section. Beginning in the late 1940s, the Missouri River was dammed to create four massive reservoirs: Lake Oahe, Lake Sharpe, Lake Francis Case, and Lewis and Clark Lake. These have come to be known as the "South Dakota Great Lakes." These lakes, which have over 900 square miles of open water, also have over 3,000 miles of shore. Much of South Dakota, with the notable exception of the Black Hills, is dominated by a temperate grasslands biome. Although grasses and crops cover most of this region, deciduous trees such as cottonwoods, elms, and willows are common near rivers and in shelter belts. 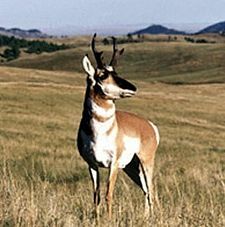 Mammals in this area include bison, deer, pronghorn, coyotes, and prarie dogs. The state bird, the ring-necked pheasant, has adapted particularly well to the area after being introduced from China, and growing populations of bald eagles are spread throughout the state, especially near the Missouri River. Rivers and lakes of the grasslands support populations of walleye, carp, pike, and bass, along with other species. The Missouri River also contains the pre-historic paddlefish. South Dakota has a continental climate with four very distinct seasons ranging from typically very cold winters and hot summers. During the summers, the average high temperature throughout the state is close to 90 °F for the high temperature, although it often cools down to close to 60 °F at night. It is not unusual for South Dakota to have severe hot, dry spells in the summer with the temperature climbing above 100 °F for days or weeks at a time. Winters are cold with high temperatures in January averaging below freezing and low temperatures averaging below 10 °F in most of the state. What is now South Dakota has been inhabited for at least several thousand years. French and other European explorers in the 1700s encountered a variety of groups including the Omaha and Arikara (Ree), but by the early 1800s the Sioux (Dakota, Lakota, and Nakota) were dominant. In 1743, the LaVerendrye brothers buried a plate near the site of modern day Pierre, claiming the region for France as part of greater Louisiana. In 1803, the United States purchased the Louisiana Territory from Napoleon. President Thomas Jefferson organized a group called the Corps of Discovery, led by Meriwether Lewis and William Clark (commonly referred to as "Lewis and Clark Expedition"), to explore the newly-acquired region. In 1817, an American fur trading post was set up at present-day Fort Pierre, beginning continuous American settlement of the area. Through much of the 19th century, exploratory expeditions such as those of Lewis and Clark and Joseph Nicollet coincided with an increasing presence of the U.S. Army. In 1855, the U.S. Army bought Fort Pierre but abandoned it the following year in favor of Fort Randall to the south. Settlement by Americans and Europeans was, by this time, increasing rapidly, and in 1858, the Yankton Sioux signed the 1858 Treaty, ceding most of present-day eastern South Dakota to the United States. Land speculators founded two of eastern South Dakota's largest present-day cities: Sioux Falls in 1856 and Yankton in 1859. In 1861, Dakota Territory was recognized by the United States government (this initially included North Dakota, South Dakota, and parts of Montana and Wyoming). Settlers from Scandinavia, Germany, Ireland, and Russia, as well as elsewhere in Europe and from the eastern U.S. states, increased from a trickle to a flood, especially after the completion of an eastern railway link to the territorial capital of Yankton in 1872, and the discovery of gold in the Black Hills in 1874 during a military expedition led by George Armstrong Custer. This expedition took place despite the fact that the western half of present day South Dakota had been granted to the Sioux by the Treaty of Fort Laramie (1868) as part of the Great Sioux Reservation. The Sioux declined to grant mining rights or land in the Black Hills, and war broke out after the U.S. failed to stop white miners and settlers from entering the region. The Sioux were eventually defeated and settled on Reservations within South Dakota and North Dakota. An increasing population in Dakota Territory caused the territory to be divided in half. A bill proposing statehood for North Dakota and South Dakota (as well as Montana and Washington) titled the Enabling Act of 1889 was passed on February 22, 1889 during the Administration of Grover Cleveland. It was left to his successor, Benjamin Harrison, to sign proclamations formally admitting North and South Dakota to the Union on November 2, 1889. Sitting Bull shortly before his death, just prior to the Wounded Knee massacre. Miniconjou chief Bigfoot lies dead in the snow after massacre at Wounded Knee. The flood of white settlers into the area of the Dakotas overwhelmed the Lakota. The 1870s gold rush in the Black Hills brought hordes of prospectors and settlers. The Black Hills formed a part of the land assigned to the Lakota by the 1868 Fort Laramie Treaty and they considered it sacred. The tribe was pressured to give up the Hills but they refused, knowing that if they did so the area would be destroyed by mining. Frustrated by the refusal of the Lakota to give up the Black Hills, the government ordered the Lakota confined to their reservation in 1876. Indians found off their reservations were returned forcefully. By 1889, the situation on the reservations was getting desperate. To help support the Sioux during the period of transition, the Bureau of Indian Affairs (BIA) was delegated the responsibility of supplying them with food. By the end of the 1890 growing season, a time of intense heat and low rainfall, it was clear that the land was unable to produce substantial agricultural yields. Unfortunately, this was also the time when the government decided to cut the rations in half. With the bison virtually eradicated from the plains a few years earlier, the Sioux began to starve. On December 15, an event occurred that set off a chain reaction ending in the massacre at Wounded Knee. Chief Sitting Bull had been killed at his cabin on the Standing Rock Reservation by Indian police who were trying to arrest him on government orders. Sitting Bull was one of the Lakota’s tribal leaders, and after his death, refugees from Sitting Bull’s tribe fled in fear. 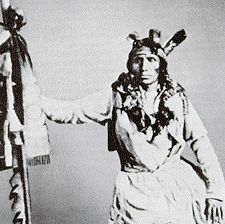 They joined Sitting Bull's half brother, Big Foot, at a reservation at Cheyenne River. Unaware that Big Foot had renounced the Ghost Dance, General Nelson A. Miles ordered him to move his people to a nearby fort. By December 28, Big Foot was seriously ill with pneumonia. His tribe then set off to seek shelter with Chief Red Cloud at the Pine Ridge reservation. Big Foot’s band was intercepted by Major Samuel Whitside and his battalion of the Seventh Cavalry Regiment and were escorted five miles westward to Wounded Knee Creek. There, through confusion due to misunderstanding of culture and poor translation of the language, scuffles ensued, culminating in what was to become known as the Wounded Knee Massacre. During the 1930s, several economic and climatic conditions combined, providing disastrous results for South Dakota. 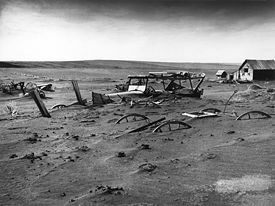 A lack of rainfall, extremely high temperatures and over-cultivation of farmland produced what was known as the Dust Bowl in South Dakota and several other plains states. Fertile topsoil was blown away in massive dust storms, and several harvests were completely ruined. The experiences of the dust bowl, coupled with local bank foreclosures and the general economic effects of the Great Depression, resulted in many South Dakotans leaving the state. The population of South Dakota declined by more than 7 percent between 1930 and 1940. South Dakota's capital city and seat of government is Pierre (pronounced as pier, not as the French-sounding name pee-air). The city's population in July 2006 was just over 14,000, making it the least populated capital city in the U.S., with the exception of Montpelier, Vermont. Founded in 1880 on the Missouri River opposite Fort Pierre, the city has been South Dakota's capital since it gained statehood on November 11, 1889. Prior to that time, the cities of Yankton and Bismarck were governing seats to the territory that was to become South Dakota. Situated on the rough river bluffs overlooking the Missouri River, the city is one of only five state capitals that does not have a major interstate highway running through it. Construction on the limestone and white marble capital building was begun in 1905. The city is known throughout the region for its Memorial Hall. 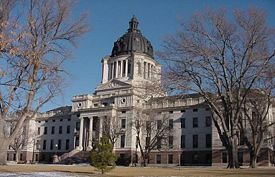 South Dakota has three branches of government: executive, legislative, and judicial. Currently, there are 35 members of the state Senate and 70 members of the House of Representatives. The state is composed of 35 legislative districts. Voters elect 1 senator and 2 representatives from each district. The legislature meets once a year on the second Tuesday in January, and also if the governor calls a special session. The state Supreme Court is the highest court in South Dakota and the court of last resort for state appellate actions. The chief justice and four justices comprise the South Dakota Supreme Court. South Dakota is divided into seven judicial circuits. There are 39 circuit judges serving in the seven circuits. Circuit courts are the state's trial courts of general jurisdiction. There are 12 full-time and 3 part-time magistrate judges in the seven circuits. Magistrate courts assist the circuit courts in disposing of misdemeanor criminal cases and minor civil actions. These courts of limited jurisdiction make the judicial system more accessible to the public by providing a means of direct court contact for the average citizen. Each of the state's nine Sioux reservation groups has its own elected tribal government, six of which are authorized by the Indian Reorganization Act of 1934. The Yankton Sioux tribe sustains a constitution adopted in 1932. South Dakota is represented at the federal level by two senators and one representative. The Republican Party has been the dominant party since territorial times, and the state has not supported a Democratic presidential candidate since 1964—especially notable when one considers that George McGovern, the Democratic nominee in 1972, was from South Dakota. In 2004, George W. Bush won the state's three electoral votes with 59.9 percent of the vote. Additionally, a Democrat has not won the governorship since 1978. In 2007 all but one of the statewide elected officers were Republicans. The Missouri River bisects the state and has been considered the dividing line between conservative and moderate political stances. Generally east of the River (or "East River") is more moderate while west of the river ("West River") tends to be more conservative. There are large exceptions to this generalization, however, as the strongest Democratic counties in the state are within the Indian Reservations of the West River area. The strongest Republican counties are located East River, in areas of predominate German/Russian ancestry. Many observers believe that the James River Valley is the actual political dividing line between East River political thought and West River political thought. According to the U.S. Bureau of Economic Analysis, the gross state product of South Dakota was $29.4 billion as of 2004. The per capita personal income was $26,894, the 37th highest in the nation and 13.08 percent below the national average. Thirteen percent of the population lived below the poverty line. The state's unemployment rate has been significantly lower than the average rate throughout the country, 3 percent in July of 2007, and is expected to remain low. The state is rich in mineral resources. Granite, clays, limestone, crushed stone, sand and gravel and petroleum are its most important mined products. Gypsum and natural gas are also mined. The town of Lead's Homestake Mine was closed in 2001; until that time the state was a leading producer of gold. Gold mining still occurs but on a small scale. Agriculture has historically been a key component of the South Dakota economy. Although other industries have expanded rapidly in recent decades, agricultural production is still very important to the state's economy. Major products include beef, wheat, corn (maize), pork, wool, soybeans, oats, mutton, alfalfa, sunflowers, and poultry. Agriculture-related industries such as meat packing and ethanol production also have a considerable economic impact on the state. South Dakota is one of the top five ethanol-producing states in the nation. Beef cattle comprise 34 percent of the state's total agricultural receipts and 4 percent of the nations cattle production. Also raised are hogs, lambs, sheep and wool. The finance, insurance and real estate industry is the most valuable industry group in South Dakota, accounting for over 17 percent of the Gross State Product. Ranking second is the community, business and personal services group, such as private health care, law firms, motels and repair shops. Wholesale (groceries, farm products) and retail trade ranks third in the state's industry group. Combined with agriculture, forestry, fishing, and hunting, these industries account for over 50 percent of South Dakota's Gross State Product. As of 2005, South Dakota had the lowest per capita total state tax rate in the U.S. The state does not levy inheritance taxes, personal or corporate income taxes or taxes on intangible personal property. The state sales tax rate is 4 percent. Various localities have local levies so that in some areas the rate is 6 percent. The state sales tax does not apply to sales to Indians on Indian Reservations, but many reservations have a compact with the state. Businesses on the reservation collect the tax and the state refunds to the Indian Tribes the percentage of sales tax collections relating to the ratio of Indian population to total population in the county or area affected. Two major interstate highways pass through South Dakota: Interstate 90, which runs east and west; and Interstate 29, running north and south in the eastern portion of the state. The counties and towns along Interstate 29 make up what is locally referred to as "the I-29 corridor." This area features generally higher rates of population and economic growth than areas in eastern South Dakota that are further from the interstate. Interstate 90, being a major route between western national parks and large cities to the east, brings many out-of-state travellers through South Dakota, thus helping to boost the tourism and hospitality industries. Also located in the state are the shorter interstates 190, a spur into central Rapid City, and 229, a loop around eastern and southern Sioux Falls. Several major U.S. highways pass through the state. U.S. routes 12, 14, 16, 18, and 212 travel east and west, while U.S. routes 81, 83, 85 and 281 run north and south. According to the U.S. Census Bureau, as of 2005, South Dakota had an estimated population of 775,933, which is an increase of 5,312, or 0.7 percent, from the prior year and an increase of 21,093, or 2.8 percent, since the year 2000. The five largest ancestry groups in South Dakota are: German (40.7 percent), Norwegian (15.3 percent), Irish (10.4 percent), Native American (8.3 percent), and English (7.1 percent). South Dakota is predominately Christian (86 percent), with the largest percentages being either Lutheran (27 percent) or Roman Catholic (25 percent). German-Americans are the largest ancestry group in most parts of the state, especially in the east, although there are also large Scandinavian populations in some counties. American Indians, largely Sioux, are predominant in several counties. South Dakota has the fourth highest proportion of Native Americans of any state, behind Alaska, Oklahoma, and New Mexico. South Dakota, in common with five other Midwest states (Nebraska, Kansas, Oklahoma, North Dakota, and Iowa), is experiencing a trend of falling populations in rural counties, despite an overall increase in population for all of these states except North Dakota. Eighty-nine percent of the total number of cities in these six states have fewer than 3,000 people; hundreds have fewer than 1000. Between 1996 and 2004, almost half a million people, nearly half with college degrees, left the six states. "Rural flight" as it is called has led to offers of free land and tax breaks as enticements to newcomers. South Dakota contains nine Indian Reservations. Five of the state's counties, Corson, Dewey, Shannon, Todd, and Ziebach, lie entirely within reservations. Cheyenne River Reservation, located in the north central section of the state bordering the Missouri River on its east, includes four bands of the Lakota nation: Minnecoujou, Itazipco (Sans Arc), Si Sapa (Blackfoot), and the Oohenumpa (Two Kettle) bands. Crow Creek Reservation is along the east bank of the Missouri River in central South Dakota. Flandreau Santee Tribal Lands are 5,000 acres of combined trust and fee tribal land located along and near the Big Sioux River in Moody County, in a region known as the Prairie Coteau. The Flandreau Santee Sioux Tribe is comprised primarily of descendents of "Mdewakantonwan," a member of the Isanti division of the Great Sioux Nation. Lower Brule Reservation, located in central South Dakota, approximately 58 miles southeast of Fort Pierre on historic Highway 1806, also known as the Native American Scenic Byway. Pine Ridge Oglala Reservation is home to the Oglala Sioux Tribe. Located partially in the Badlands, it is the 2nd largest reservation in the U.S. and has an estimated population of close to 40,000. Rosebud Reservation located in the south-central part of the state is home to the "Sicangu Lakota Oyate" or "Burnt Thigh People." Sisseton - Wahpeton Oyate Tribal Lands are in the rolling, mysterious, hills of northeastern South Dakota. Standing Rock Reservation is situated in North and South Dakota. The people of Standing Rock include the Upper Yanktonai in their language called Ihanktonwana which translates "Little End Village" and Lower Yanktonai, called Hunkpatina in their language, "Campers at the Horn" or "End of the Camping Circle." Yankton Tribal Lands are along the Missouri River bottom in the southeast section of the state, and headquartered at Marty, home of the Marty Indian School. As of 2006, South Dakota had a total primary and secondary school enrollment of 136,872, with 120,278 of these students being educated in the public school system. There were 703 public schools in 168 school districts, giving South Dakota the highest number of schools per capita in the United States. South Dakota Public Universities and Research Center is a cooperative higher education delivery system in Sioux Falls, South Dakota. Four universities, University of South Dakota, Dakota State University, South Dakota State University, and Northern State University, offer classes at this site. The site, until recently known as "USDSU," has become extremely popular with non-traditional students living in or around Sioux Falls. Two national parks have been established in South Dakota, both of which are located in the southwestern part of the state. 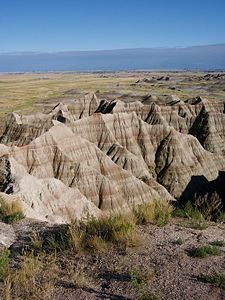 Badlands National Park was created in 1978. The park features a highly eroded, brightly-colored landscape surrounded by semi-arid grasslands. Wind Cave National Park, established in 1903 in the Black Hills, contains an extensive cave network as well as a large herd of bison. Mount Rushmore National Memorial in the Black Hills was established in 1925. 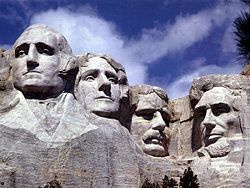 The well-known attraction features a mountain carved by sculptor Gutzon Borglum to resemble four former U.S. presidents. Other areas managed by the National Park Service include Jewel Cave National Monument near the town of Custer, the Lewis and Clark National Historic Trail, the Minuteman Missile National Historic Site, which features a decommissioned nuclear missile silo, and the Missouri National Recreational River. The deepest mine in the United States, the Homestake gold mine (now defunct) is in the Black Hills, near the town of Lead. Its shaft plunges more than 8,000 feet (2,400 m) beneath the surface. From 1969 to 1993, it was home to the Homestake Chlorine Solar Neutrino Experiment, famous for detecting the solar neutrino problem. The South Dakota State Legislature and governor recently passed legislation giving the mine to the National Science Foundation for use as an underground research laboratory. The largest and most complete fossil of Tyrannosaurus rex ever found was uncovered near the town of Faith in 1990. Named "Sue," the remains are over 90 percent complete and are on display at the Field Museum of Natural History in Chicago. ↑ South Dakota Codified Laws (1–27–20). South Dakota State Legislature. Retrieved April 27, 2010. ↑ Land and Water Area of States (2000). infoplease.com. Retrieved September 3, 2007. ↑ Linda Hasselstrom. 1994. Roadside History of South Dakota. (Missoula, MT: Mountain Press Publishing Company. ISBN 0878422625), 2-4. ↑ Northern State University. An Educator's Guide to South Dakota's Natural Resources Retrieved December 8, 2007. ↑ Dictionary of Canadian History. Gaultier De La Verendrye, Louis-Joseph Retrieved December 8, 2007. ↑ Alice Beck Kehoe. 1989. The ghost dance ethnohistory and revitalization. Case studies in cultural anthropology. (New York: Holt, Rinehart, and Winston. ISBN 0030028523), 15. ↑ James Mooney, The Ghost-Dance Religion and Wounded Knee, originally published as The Ghost-Dance Religion and the Sioux Outbreak of 1890 as part of the Fourteenth Annual Report of the Bureau of American Ethnology 1896. (New York: Dover edition, 1973). ↑ Eyewitness to history. 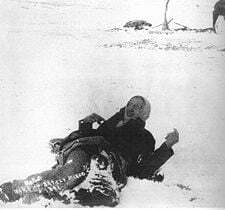 Massacre at Wounded Knee 1890 Retrieved December 8, 2007. ↑ National Drought Mitigation Center. Drought in the Dust Bowl Years Retrieved December 8, 2007. ↑ www.answers.com. Pick-Sloan Missouri Basin Program Retrieved December 8, 2007. ↑ Cara Hetland. February 24, 2006. Sioux Falls 25 years after Citibank's arrival Minnesota Public Radio. Retrieved December 8, 2007. ↑ Jack Coffman and George Anthan. Sweeping out the Plains The Alicia Patterson Foundation Program. Retrieved December 8, 2007. ↑ Encyclopædia Britannica. 2007. South Dakota Encyclopædia Britannica Online. Retrieved December 7, 2007. ↑ State of South Dakota. Signs and Symbols of South Dakota Retrieved October 29, 2007. ↑ Nebraska Energy Office. Ethanol Production By State Retrieved December 5, 2007. ↑ NETSTATE.COM South Dakota Economy Retrieved December 5, 2007. ↑ Sturgis.com. Sturgis Rally Attendance Statistics Retrieved December 5, 2007. ↑ South Dakota Department of Tourism. South Dakota Tourism Statistics Retrieved December 5, 2007. ↑ U.S. Census Bureau. States Ranked by Total State Taxes and Per Capita Amount: 2005 Retrieved December 5, 2007. ↑ National Scenic Byways Online. Native American Scenic Byway - South Dakota Retrieved December 8, 2007. ↑ South Dakota Department of Education. Learning Leadership Service Retrieved December 8, 2007. The Greatest Lakes of South Dakota. Great Lakes of South Dakota Association. 2007. Mooney, James. The Ghost-Dance Religion and Wounded Knee, originally published as The Ghost-Dance Religion and the Sioux Outbreak of 1890, as part of the Fourteenth Annual Report of the Bureau of American Ethnology. . New York: Dover edition, 1973. United States Geological Survey. Science In Your Backyard: South Dakota. U.S. Census Bureau. South Dakota. This page was last modified on 13 October 2015, at 15:05.